Every generation a magician comes along, whose intention is to record magic in an encyclopedic fashion. Professor Hoffmann was the first in recorded history to attempt such a feat with his trilogy Modern Magic , More Magic , and Later Magic . Certainly many magic books have been published before him, mostly copying from each other. But none reaches the depth and breadth of Prof. Hoffmann's work. 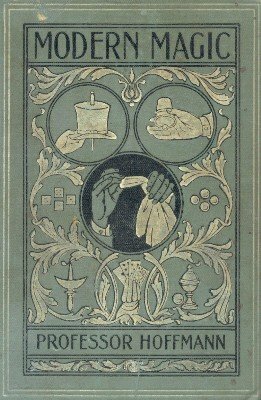 The material in these three books records the state of the art of magic in the late 19th century. Today we know more tricks and we have also refined our techniques and methods. But it is astounding how much was already known at that time. Reading carefully you will discover several clever methods which have been forgotten or have fallen out of fashion with today's popular magicians. If you really want to fool your magic friends the next time, read this book and perform one of its many not so well known secrets. 1st edition, 1876, Routledge; 1st US edition, 1882, Routledge; reprinted many times by various publishers; 563 pages. GENERAL PRINCIPLES OF SLEIGHT-OF-HAND APPLICABLE TO CARD TRICKS. To Make a "False Shuffle"
CARD TRICKS WITH ORDINARY CARDS, AND NOT REQUIRING SLEIGHT-OF-HAND. TRICKS INVOLVING SLEIGHT-OF-HAND, OR THE USE OF SPECIALLY PREPARED CARDS. To Make Four Cards change from Eights to Twos, from Black to Red, etc. The "Card and Bird Box"
PRINCIPLES OF sLEIGHT-OF-HAND MORE ESPECIALLY APPLICABLE TO COIN TRICKS. TRICKS WITH COIN WITHOUT APPARATUS. TRICKS WITH COIN REQUIRING SPECIAL APPARATUS. The Animated Coin, which answers Questions, etc. The Brass Box, known as the "Plug-box"
TRICKS WITH DOMINOES AND DICE. BALL TRICKS REQUIRING SPECIAL APPARATUS.